Ocipaws Ocicats began with the purchase of littermate boys, Bert and Bubba. After having them for some months I, along with some prompting from the breeder, decided to show Bert. 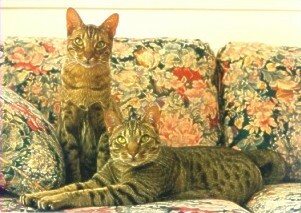 So began my Ocicat show career. Shatori Tradecentric, better known as 'Bert', became my first Grand Premier. Thank you, Victoria Garvin, for allowing me to start my show career and begin breeding this wonderful breed of cat. Creating and developing beautiful, healthy, loving and playful Ocicats is very rewarding. Seeing a beautiful wild looking cat with a 'pussycat' temperament is the greatest. I chose Ocicats because of the wild look, mild temperament and playful attitude. I believe they would make a wonderful addition to anyone's home. I am located in the Cincinnati, Ohio area. I am pleased to be the CFA Ocicat Breed Council Secretary, representing the members of the Ocicat Breed Council as they strive to preserve this fabulous breed.